Pho Real is many of my friends' favorite pho spot! I met up with my girl friends for a night of laughing and getting our fix of pho. Isn't the name so awesome? I grew up in Silver Spring, so it's great coming back (not like I live that far away, haha) but my friends don't live around the corner like before, so it's nice to meet up around our old stomping grounds once and a while. It is located in a small shopping center, so parking can be limited. The closest metro station is Glenmont on the red line. The interior has minimal amounts of decor, but still looks welcoming. There are a good amount of long tables for large groups or sharing during busy times. Like many pho restaurants they offer a limited menu. They only have 2 appetizers and pho aside from drinks. My friend ordered a Mango Bubble Tea, which was so fresh and delicious! A bunch of us, including myself ordered our Vietnamese Iced Coffee to-go, but it was so good that we finished them in the restaurant. One of my friends ordered Spring Rolls ($3.99), which looked really good! You only receive 2, so I thought it was a tad steep. One of my friends took ALL of the raw bean sprouts and put them into her pho. I never ever eat those! I'm an extra lime and basil kind-of girl. I ordered a small bowl of #13 - Tai, Gan (slices of eye round steak and soft tendon) for $6.99. They have a clear yet flavorful broth and the best soft tendon around. Based strictly on the broth, Pho 75 is still #1 in my book because it is extra fatty and full of flavor that you can see sink to the bottom of the bowl when you're done. 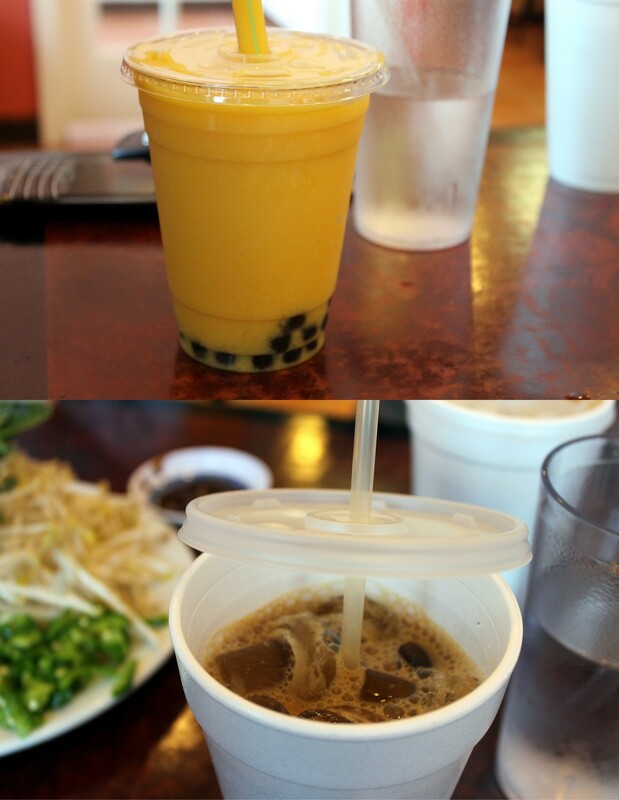 Pho Real has high quality ingredients, bubble tea, spring/summer rolls and such a nice staff. Every time I come I never feel rushed, and they are just so friendly! Price wise, their bowls are $.50-$1 more expensive than my other usual spots. Either way, I enjoy my dinners and hangover Sundays there. I met up with my girl Michele of Squirrels-n-Sweets for a long overdue dinner. Her baking and cooking blog is so ADORABLE. Her personality just shines through her writing. She explains her recipes very clearly and honestly, and finds the coolest angles for her pics. We decided on Teaism for a casual Asian-inspired meal. There are a few benches out front, but no tables for actual dining. There is always limited street parking, so take the metro to Dupont Circle on the red line and exit towards Q St. This small place has a cute, Japanese, hippie feel to it. Very calm and relaxing on the inside. What makes the experience casual is that you order at a register, pick up your food when your number is called, find a seat, get your own utensils and bus your own plates. This location has two floors. This is pretty much the only seating on the ground floor, where we ate. Upstairs has a few more tables, but it's definitely not a place to go with a large group. Their Asian-inspired dishes appear healthier and simple. Many dishes offer brown rice, grilled items and vegetarian options. You can see Japanese, Indian, Thai, Vietnamese, Middle Eastern and Chinese selections on the menu. The price range is $8-10. They also offer a variety of drinks, loose teas and desserts. It has been hot in the DMV, so we both sought after the perfect thirst quencher. The Ginger Lemonade ($2.25) hit the spot. I could always go for more ginger than most places add, but nevertheless, it did its job. Michele ordered the Thai Chicken Curry (yellow curry with chicken, coconut milk, jicama, carrots, green beans & brown rice) for $9. It was a pretty good portion because she couldn't finish it. I ate some and thought it was pretty good! The brown rice and extra veggies made the dish taste healthier. The curry also appeared more watery than I'm used to but still had the right amount of spice. Before I ordered the Palak Paneer, Michele reminded me that I don't need to write about it for the 10th time. True! I decided to try the Buffalo Burger (grass-fed buffalo, with lettuce, tomato, onion & BBQ sauce on focaccia bread & Asian slaw) for $9. It was interesting eating a burger on focaccia bread, but it was good! The meat, veggies and sauce worked well together and tasted very healthy. I didn't care for the slaw though it was very fresh. Overall, I thought the place was cute and had healthier versions of popular dishes. Once again, not a place to come with a group because of the lack of space/seating. I don't think I'll ever crave the items we had, but I'd be curious to try their other dishes. If you prefer more "authenticity", these healthier (while tasty) dishes might not be for you.